Hermoso apartamento de 3 dormitorios en el aclamado Coral Sands Resort. Disfrutar de las vistas desde el balcón con vistas a la playa de Trinidad y despertarse con el sonido de las olas. Situado justo enfrente de la playa de la Trinidad en la 2ª planta. La unidad cuenta con dos balcones, tanto con vistas a la playa y el Mar del Coral. Si bien conserva la sensación de un pequeño pueblo en la playa, pero cerca de todos los servicios, Trinity Beach es la plataforma de lanzamiento ideal para todo lo que la Costa de Coral y la Gran Barrera de Coral tienen para ofrecer. 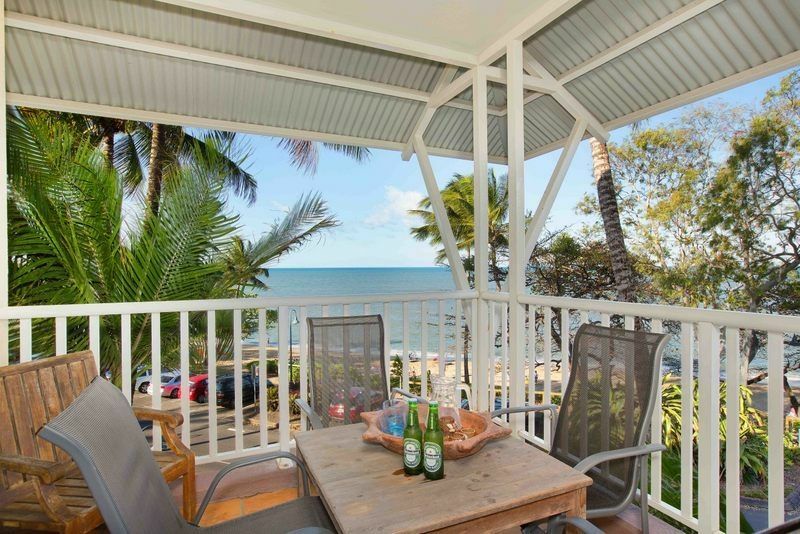 Excellent location right on the beach with great ocean views. Matthew and his team have done a great job furnishing this with everything you need for a great holiday. Matthew was a great host he called the day before and checked in with me to make sure all was good. Gorgeous! Our family of 5 absolutely loved staying at The Beach Shack last week. The apartment is very clean and all updated, with everything needed included, like pillows, beach towels, tea towels, etc. The view of the ocean through the palm trees is amazing! We enjoyed eating on the balcony and listening to the surf all day. The pool at Coral Sands was very fun for the kids, who spent half their time swimming in the ocean across the street and half snorkeling in the pool. Matthew was excellent to work with, accommodating our late check-in and providing us with lots of local information. The Beach Shack provided us with a parking spot in the underground parking at Coral Sands, which was perfect for parking the rental car. We had a snorkel excursion out of Port Douglas, and spent part of our time in Cairns and Palm Cove, but I have to say we found Trinity Beach to be the nicest area to stay and relax at the pool and beach. Very family friendly area, and we really felt blessed to have had a stay here. Thanks, Matt! we were so amazed by this place! we loved everything about it! we are so happy that we chose the beach shack and we'll recommend it any time, and we def want to come back some day.